"Full Time,Established 30+ Years,Wide Range Of Services"
Established over 30 years we are a full time family business offering mobile discos, DJs, karaoke, video DJs, lighting, PA, flooring and other equipment hire as well as live mixing services to bands along with PA hire. We offer superb value for money, expert advice and a professional solution be it for a family party or a weekend festival. Your party or event will have a bespoke set-up selected from our huge selection of professional equipment - not the typical single solution semi-pro range used by many mobile operators. We can shake the building with 10s of KWs or provide background music in one room and a disco in another. On our website you can read more about us, and learn about our equipment and philosophy, see pictures from various events and a few of the lighting effects we have in use. If you're using us for your party you can get everyone involved and build your playlist online from our library so we know exactly what you'd like to hear at your party. Required by many venues, Megasong has a current PLI policy with National Association of Disc Jockeys in the amount of £10 million. Also required by many venues, Megasong has supplied satisfactory evidence of holding current PAT inspections of their equipment dated within the last 12 months. A Method Statement outlining Megasong&apos;s Health & Safety procedure for setting up disco equipment has been provided. Megasong has provided Risk Assessments undertaken at events sourced via needadisco.com, indicating that they can undertake these competently. Why do people choose to book Megasong? Fantastic service - many thanks! "Great service. Stage truck perfect for us as provided stage and protected area all in one and fast set up. Megasong ended up providing generator at last minute as had to put truck in different place, noting seemd too much trouble for them. System ideally suited to our needs and Steve was extremely helpful from first meeting right through. Thank you for finding us the right company for us will use you again. Megasong are a credit to you, we did not expect to find such a good match.."
"It was a pleasure to serve you. We are happy to have done a number of further events for you and look forward to many more." "Excellent DJ, excellent selection of music, kept the party going and made the night memorable. If I get married again, I definitely us megasong!" Megasong also offers a range of additional party services not directly linked to musical entertainment. 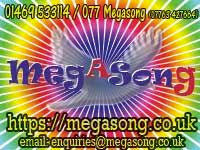 Get FREE no-obligation disco quotes from Megasong and other DJs covering your venue. Take 2 minutes to fill in some basic details and we'll do the rest! If you are contacting Megasong about an event, it's always a good idea to include the DATE, LOCATION, EVENT TYPE, AGE GROUP and TIMINGS to speed things up!